Monica Baptista Reports: Kingsbury Classic 10k is a well organised scenic small race that takes place through the glorious scenery of Kingsbury Water Park. It was a two lap course of footpaths, grass fields, muddy tracks and short tarmac sections. Me, Mat, Aine and Kiri were the only Harriers running and we made our way across town through the hellish traffic and luckily we all made it in time. Lesley Pymm and her husband were marshalling and supporting, it was nice too see them twice on the route, giving us an extra shout of encouragement. 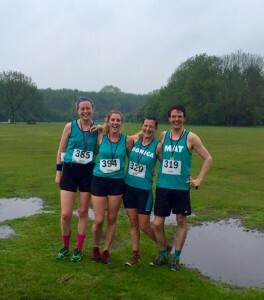 I think Lesley would have preferred to run this one as it was a real gritty muddy run. The registration was at the wildlife visitor centre. We got our numbers and then sat at the coffee shop to keep warm and shelter from the rain. The weather had been terrible all day, but it cleared up in the evening so we experienced a refreshingly warm run with guaranteed mud! I had been nursing a cold/cough since my marathon so I made a trip to town at lunchtime and got back with vitamin C tablets and a giant watermelon in an attempt to magically boost my immune system! By 6pm, after eating most of the watermelon, we had to decide whether to do this race or not and we officially had melon belly! I was reluctant to go as I just had three days of consecutive tough running, but decided to go anyway as we thought what a better way to spend a cold wet evening plus I knew I would regret it more if I didn’t go. We were so unprepared for this that we didn’t even have our teal vests clean so I just dug out our stinking vests from the washing basket in the morning and put them in a plastic bag just in case we decided to got later on. This race was on a memorable day for me and a lot of my bvh friends. It was the 4th anniversary of Joe Lewis passing away. I read Dean’s emotional words about Joe in the morning that were followed by others sharing their own memories. I never met Joe, but have heard so much about him that I felt that I knew him a little bit so I spent most of the day with all those words in my thoughts and i genuinely think that helped me run better and stronger. I really enjoyed this race and felt really good for most of the run despite legs feeling a bit heavy. I had no idea how I was doing until I heard a few of the marshals shouting “Well done 3rd Lady!” That kept me going strong. When my body started to fade, I remembered what Emily wrote about Joe: “Go on, they’re tiring ahead”, and all i could think was that I was the one tiring, until i started to see the 2nd lady in my horizon about 1 mile from the finish, and I just thought, maybe he’s right! maybe they are tiring ahead! that just gave me such a boost and I pretty much powered through all the way past her and then felt like I sped up all the way to the finish. We all did really well and the we were the first ladies team. This entry was posted in 10k, Race Reports by BvH Admin. Bookmark the permalink. Well done all of you – yes, you’re right, I was wishing I was running it when I saw you all charging through the mud. I was saving myself for the next day and had already been out on the bike for about 40 miles and got soaking wet during the day, so marshalling was the right thing to do. It did look so good though! Great report Monica.